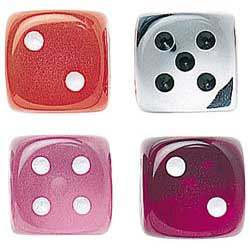 Size (inches): 0.79" X 0.79" X 0.39"
Autruche Dice are a display of beauty and quality. With all the unique colors and designs, they're sure to be the focus of any game you play! I received red clear, purple clear, green clear, blue clear and clear clear. They are very nice, but the clear clear ones make it somewhat less easy to read the dice at a glance because you can see through the dice so well that you see the dots on all sides. So, I would recommend the coloured ones, but not the clear clear ones.